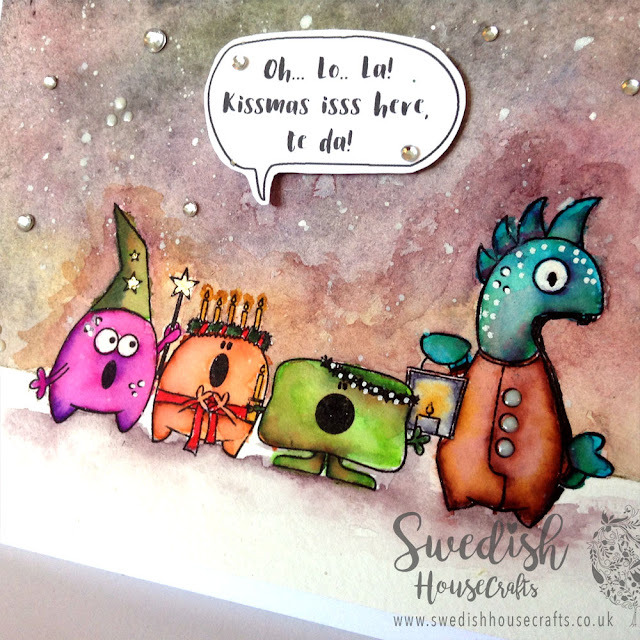 Welcome to the very first blog hop ever Swedish House Crafts is so delighted to be on. I hope you enjoy the ride as much as I enjoyed being a part of it. FIND THE WINNERS AT THE END OF THIS POST CONGRATULATIONS & THANKS FOR EVERYONE! 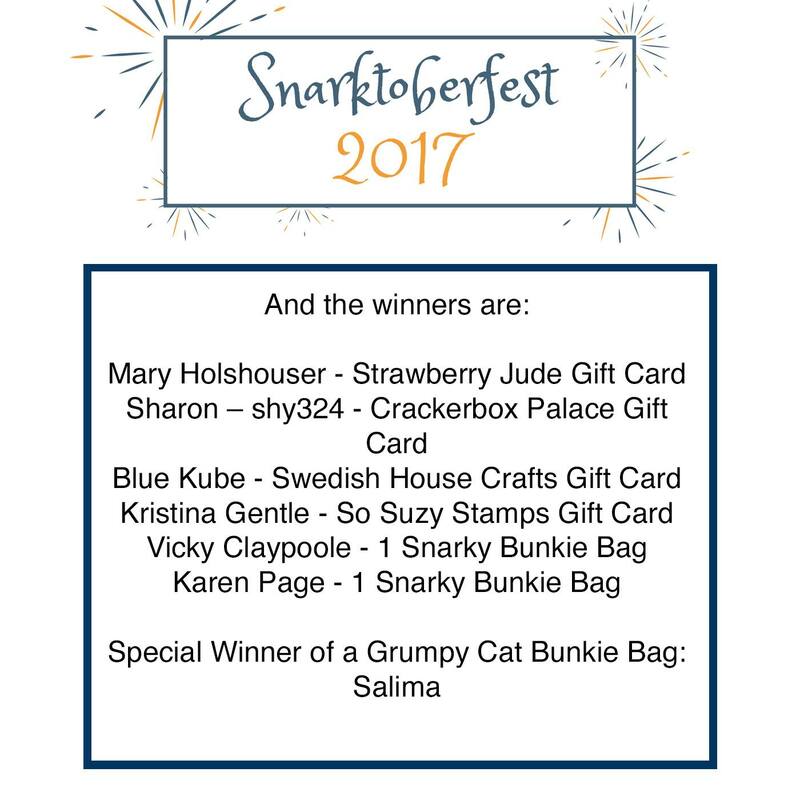 This is the Snarktoberfest for 2017. It is all about having fun with what we make. Also you have lots of chances to win one of the prizes if you leave a comment on all the blogs shown below, by the end of the 5th October. Go and visit and leave your lovely comments to our friends, everyone loves to know what's on your mind. We, lovely shop owners like me, love you so much! We decided on giving away lots of winnings... don't miss it! You never know when we may email you and knock at your door! Have you come from Tracy's blog? Yes: continue reading. No? Why not start from the beginning? go to Josefine's blog here. Let me introduce you this monster family Moto, Poto, Tito and Bobi... not really, I don't know their names, but that suits them well. They are weirdos, trust me. How do I know? because they are Swedish made! They are celebrating St. Lucia and singing the Santa Lucia song, but they have some tongue problems. Oh, what is Santa Lucia? it is a very traditional Swedish celebration on the 13th of December each year. Check it out online, then you'll know why Poto has candles on her head! A little bit on how I made the card. I stamped and masked the monsters, and water coloured the background. Also the monsters are water coloured too. I added some rhinestones to represent shiny stars and I love using white dots. The sentiment I created and printed out. I thought it suited some cute singers - especially those having problems with their pronunciations! Here is the in progress messy table. Yes I am lazy, I taped the watercolour card stock to the cutting mat and I started with the dark colours building up layers one to dry and then another on top of it. Once I was satisfied with the background I removed the masking paint and coloured my sweeties. Of course as usual everything went messy, otherwise it wouldn't be me! I thought I'd make the colouring smooth but changed my mind and thought a stained background can be cool too. 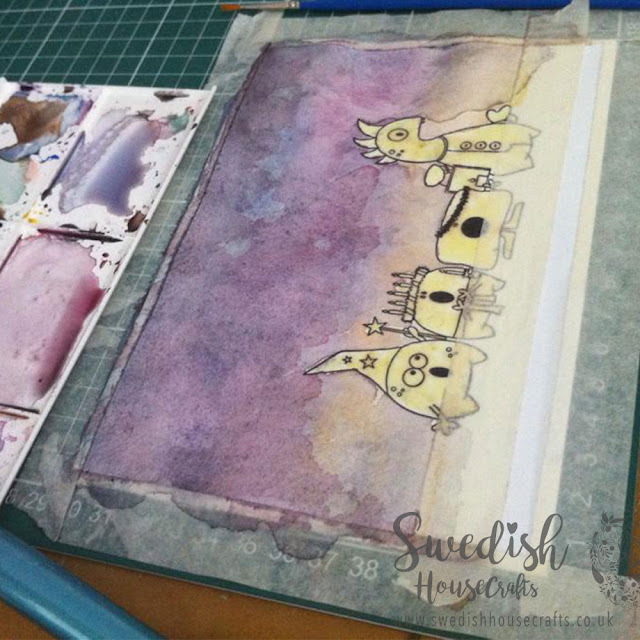 I hope you have enjoyed this trip on Swedish House Crafts and you can now continue to Laura's blog. Don't forget to leave a comment on each blog, there are lots of chances to win. A big hug from me, Suha. Love it! Thank you for the ideas. This is so awesome Suha!!! I love the bright colours of the wee monstahs and I learned something about St. Lucia to boot! Your painting skills are awesome! Such a cute card! I love your Swedish sense of humor! Love your little characters and their singing is anything but perfect :). Lovely card! These singers would brighten anyone's day! Love it!! Cute monsters and awesome job on the painting! So many amazing and funny cards on this hop! Love your monsters and that background is gorgeous! I am head-over-heels in love with these monsters! I have some relatives who would totally appreciate the St. Lucia reference! What a cute group of monsters. I think your background is great. Great holiday colors. Love the way you colored the little critters! This card is so unique. Cool background and funny looking monsters. Ooh, these little characters are going to have a fun Christmas! Suha, I love your card! Your coloring is indeed awesomesauce!!! 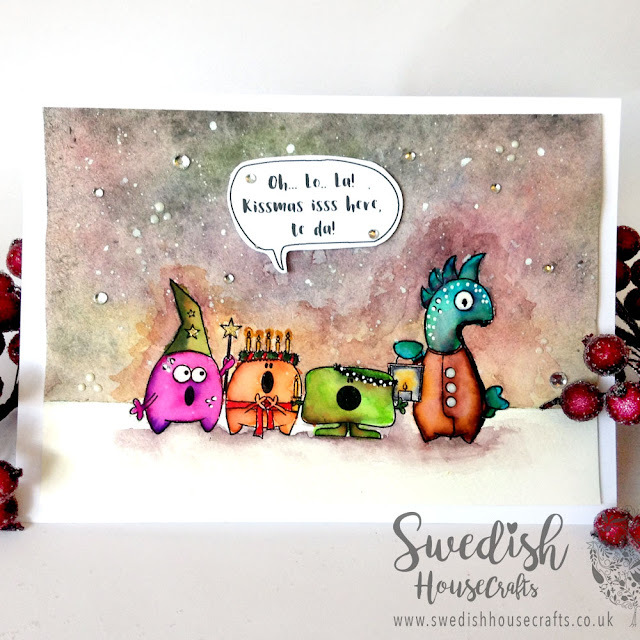 These little monsters are the cutest, I might have to get one for myself :P I love the story behind this card, so creative! Thank you so much for joining me at Snarktoberfest and for being a sponsor!!! Very very cute ... and gorgeous background! Very cute little singing monsters! Thanks for sharing! I love these colorful characters! Great colors! The messier you are, the more fun you are having! Creative people are often messy in their craft! What a lovely card - even with characters that are a little different. And now I am about to go learn about another celebration as well! Love your fun monster card...great colors! I love seeing your "messy" table and I love the background and holiday monsters. So cute! This is just too cute! Love your water coloring! Great card i love you coloring and sentiment its perfect. Those Halloween Christmas monsters are so stinking cute! Love the holiday mishmash!!! Great background for these colorful monsters. This is so fun and different! Wonderful card!! I love the little monsters. So fun!! Fantastic card! I love the background, especially the touch of bling! Oh my goodness !! Your card is just awesome ! So original and creative, congratulations !! A work of art! I will have to learn about Swedish holiday traditions. I fell in love with the background you created in the second I saw it for the first time! And those bright and fun fellows on it are just the cutest! Absolutely gorgeous! Love your card! The coloring is amazing! Enjoying the Snarktoberfest hop!